“See you later, baby.” I kissed my two-year-old’s forehead and headed to the station while she stayed with the childminder. The little one probably thought I was going to pick her up later in the day but I was going away for three days on my Big Small Isles Challenge in memory of Billy. You’d probably already know about this challenge if you had seen my status updates on Facebook or Twitter. 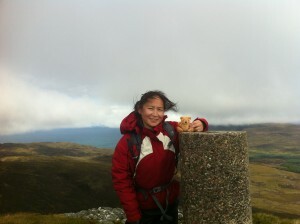 If not, I was raising funds for Down’s Syndrome Scotland taking part in this challenge hiking through the Small Isles. Thanks to my kind and generous friends and family we’d managed to collect 96% of the target by the time I set off. I was overwhelmed by people’s generosity and was very grateful. Billy’s little teddy bear came with me on the trip. The train arrived and I stepped on the train to Glasgow where I was joining three other women for the next part of journey. A quick stop at Costa Coffee and we were off to Mallaig where were taking the speed boat. The sea was rough. To be honest, I had never been on a small boat like that so I assumed that was the way it was. When we got to Eigg it was almost impossible to reach the harbour as the tide was so far out leaving not enough water for the boat to get close to the shore. After a few attempts of different angles to the harbour we managed to get to Eigg. The boat ride was rough, but much better than I expected. The driver hid his nervousness well, we were told afterwards. Apparently, the second group ride was better than ours even though we were the ones sent first as some of us were ‘vulnerable’ when it comes to travelling in the sea. After a bit of a walk we got to our bunkhouse where were staying for a couple of nights. I shared a room with four other women and it felt like we knew each other already. The next day the weather was bad and we were told we had to stay on Eigg. Our walking route took us to an Sgurr, the largest exposed piece of pitchstone in the UK and the most distinctive feature in Eigg’s landscape. It was formed as lava poured though a prehistoric riverbed from a volcano on the neighbouring island Rum. It was pretty wet and muddy. I have to say it was quite challenging because of the slippery and rocky surface at times and the thick heather bushes clung to my feet as if they were pulling me back. I didn’t have any walking sticks as I couldn’t trust my weight on something I didn’t have any control over if it slipped. I could feel that my feet were getting wet and there was no point taking big steps avoiding big puddles, instead I focused on smaller steps trying not to slip. Coming down was harder. One of my room-mates slipped into a hole just in front of me and dislocated her arm. She was very strong and still walked down a fair distance to get to the harbour where she got on a ferry to Mallaig. My feet were pretty tired and we walked to our bunkhouse where most of us got a massage. Our room-mate did the challenge with her hands. She gave massages to many of us. Oh boy, the difference I could feel after the massage was fantastic. What a great idea! These people there all wanted to do this challenge for different reasons. I was inspired, moved and touched by their stories. There was a woman who had had a baby five months before. She was amazing. The last day started early with 7am breakfast and we were off to Rum, our next stop. Wow. Really. Wow. The morning sun displayed the most beautiful scenery. It was just breath-taking. We split into two speed boats and raced towards Rum in the glorious sun. I now knew why people like going on speed boats, why they want to have one and the thrill of it. We flew over the sea riding waves. It was magical. When we came to Rum we were on our way straight to Askival, the highest mountain on Rum. This rocky mountain was much easier than the muddy path on Eigg. I realised I was pretty familiar with this kind of surface. So going up was quite hard but doable with a couple of stops for lunch and breaks. The scenery on top was just gorgeous. This time coming down was the hardest. I felt as if my toenails had grown a few more centimetres. Now the guides were speeding up as we had to catch the boats. I was walking last as I would stop to take photos. I wanted to show my kids where I was and what I had done. When it came to the boat back to Mallaig, the ride was exciting as I’d swapped boats and the driver on the “not so vulnerable” boat zig-zagged across the waves. This entry was posted in Mongol Memoir on September 15, 2013 by Uuganaa. Well done to you Uuganaa! What a challenge.